I think you guys have probably noticed by now that I love Cos. 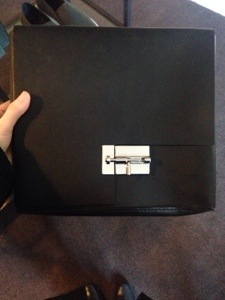 The simplicity of it, the quality, the style – I love it! So versatile and easy to wear. 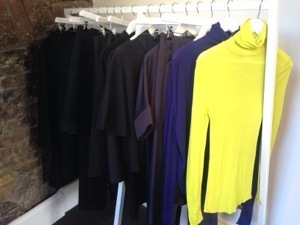 I was delighted to be invited to the preview of the Cos autumn winter 2014 which took place yesterday morning. 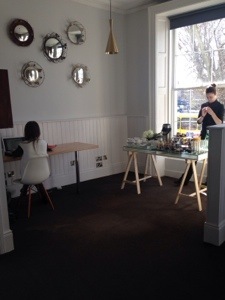 Firstly, their new showroom is to die for! It’s exactly what I’d like my imaginary house to look like when I finally decide to be a grown up. So nice. Anyway, the clothes. I loved the tones and colours in the collection. What immediately caught my eye was the rail of grey and powder blue. 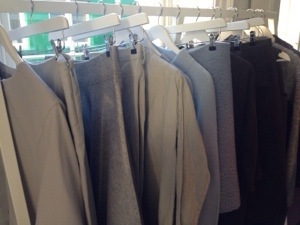 So many incredible pieces there, including incredibly soft grey trousers and a dark grey, tweed sleeveless top. Lots of raw hems and heavy fabrics, really beautiful. 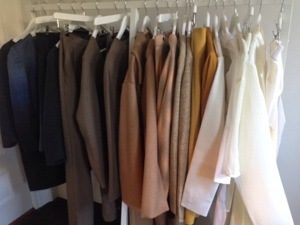 The next rail of clothes had more earthy tones, whites with camel and taupe. I loved so many of the white pieces. There was a gorgeous oversized white shirt with and entirely exposed back and a lovely white top with an exposed zip down the back made in a fabric that had a light sheen to it. Great transitional pieces. The final womens wear rail was much darker with navy dominating, but it had that amazing pop of neon too. The bags were perfect. Completely perfect. I want both. The colours, the shape, the style, the fastenings – I love everything about them. I think these two bags will fly out. Its the little extra details that make them extraordinary. These were two of my favourite pieces – there’s that white top with the exposed zip I was talking about. It doesn’t look like much in the photo, but the detail up close is amazing. 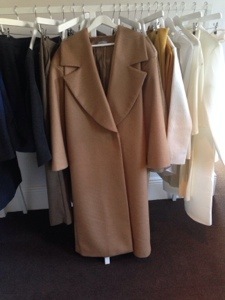 The camel coat I completely fell in love with. Unfortunately, being 5 foot 2, there isn’t a chance of me wearing it. In my heeled boots, it still dragged along the floor. I’m all about oversized clothes, but this was ridiculous. Lovely tall ladies, wear it on my short behalf please! These shoes caught my eye, so smart and understated, but with interesting details, like the camel coloured band, it almost looks like an elastic band! 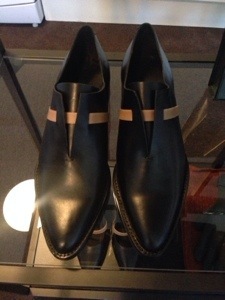 These would look great with a white shirt dress or a casual outfit that needs a little something extra. So there you have it. I’m going to settle down with my Cos lookbook now to drool over everything all over again. 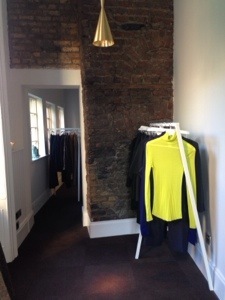 These pieces will be available in Cos stores and concessions from September onwards – I can’t wait!